Cloudiness and dirt on a tip of endoscopy are one of the causes to stop an operation. An operator feels great stress from this trouble in order to perform a best operation. In this paper we present a new system to solve this problem. There are two kinds of problem on the tip of endoscope, one is cloudiness, the other is attachment of suspended matter, such as mist or smoke. 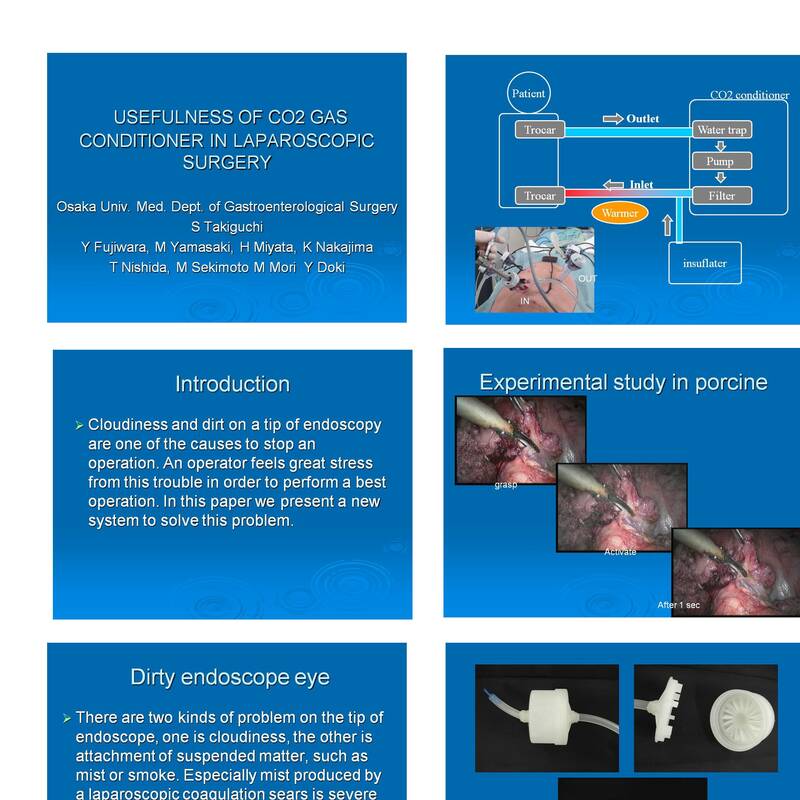 Especially mist produced by a laparoscopic coagulation sears is severe problem. Many surgeons often open a valve to remove mist from an abdominal cavity and ventilate CO2. The temperature of abdominal cavity goes down because CO2 gas from an inflator is around 18 centigrade. This causes the lens of scope tend to more cloudiness. We developed CO2 gas conditioning system to recycle CO2 gas and insufflate worm CO2 gas at 40 l/min. The performance of this system was evaluated in the pig lab. The temperature and humidity were recorded at the outlet and inlet. The lens stain was checked in the various situations, such as around electrocautery and LCS. The lens was not stained by a mist even at the 3cm in front of activated LCS, because CO2 gas made protector around a lens like an air curtain. This system will be generally used in the laparoscopic surgery, not only because ordinal trouble of laparoscopy was cleared, but because of prevention of global warming.